But HD 21749c doesn't look like a great candidate for life as we know it. Artist's illustration of HD 21749c, the first Earth-size planet found by NASA's Transiting Exoplanets Survey Satellite, as well as its sibling, HD 21749b, a warm sub-Neptune-sized world. NASA's newest planet hunter has discovered its first Earth-size alien world. 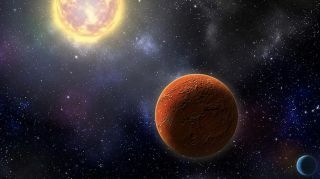 The Transiting Exoplanet Survey Satellite (TESS) spotted the planet, as well as a weird "sub-Neptune" world, circling the star HD 21749, which lies about 53 light-years from Earth, a new study reports. "It's so exciting that TESS, which launched just about a year ago, is already a game-changer in the planet-hunting business," study co-author Johanna Teske, of the Department of Terrestrial Magnetism (DTM) at the Carnegie Institution for Science in Washington, D.C., said in a statement. TESS soared to Earth orbit in April 2018 atop a SpaceX Falcon 9 rocket to hunt for planets around some of the closest and brightest stars in the sky. This work involves looking for the tiny brightness dips that occur when alien worlds cross their host stars' faces from the spacecraft's perspective. NASA's recently deceased Kepler space telescope also used this "transit method," and to great effect; Kepler has found about 70% of the 4,000 exoplanets discovered to date. But TESS' total tally should end up topping that of Kepler, NASA officials have said. Astronomers hope TESS spots some potentially habitable worlds in systems that are near enough for other instruments — such as NASA's upcoming James Webb Space Telescope — to study in detail. James Webb, which is due to launch in 2021, will probe the atmospheres of such planets, looking for gases that might be signs of life. The study team used data from various spectrographs, including the Planet Finder Spectrograph (PFS) instrument on the Magellan II telescope at Carnegie’s Las Campanas Observatory in Chile, to nail down the newfound sub-Neptune's mass. This exoplanet, known as HD 21749b, is about 23 times heftier than Earth and 2.7 times wider than our home world. Those numbers suggest HD 21749b is gaseous rather than rocky, but not as puffy as its closest comparisons in our solar system, Uranus and Neptune. HD 21749b has an orbital period of 36 Earth days — the longest of any TESS planet to date, study team members said. The exoplanet's surface temperature probably hovers around 300 degrees Fahrenheit (150 degrees Celsius), the researchers said in January, when they announced the existence of HD 21749b and hints of its smaller neighbor. That newly confirmed neighbor, HD 21749c, appears to be about the same size as Earth, but its mass is tough to nail down at present. "Measuring the exact mass and composition of such a small planet will be challenging, but important for comparing HD 21749c to Earth," study co-author Sharon Wang, also of the DTM, said in the same statement. "Carnegie’s PFS team is continuing to collect data on this object with this goal in mind." Though HD 21749c does not seem to be suitable for Earth-like life, other TESS finds may well fit that bill, researchers said. “For stars that are very close by and very bright, we expected to find up to a couple dozen Earth-sized planets," study lead author Diana Dragomir, a postdoctoral researcher at the Massachusetts Institute of Technology's Kavli Institute for Astrophysics and Space Research, said in the same statement. HD 21749c "sets the path for finding smaller planets around even smaller stars, and those planets may potentially be habitable," she added. The new study was published online today (April 15) in The Astrophysical Journal Letters. You can read a preprint of it for free at arXiv.org.